It is pretty and will go well with a black tux. Quality service, quality product and priced right. The bow tie was absolutely perfect!!! It arrived just in time for the gala, 1 day prior. The color paired well with my gray micro suede tux. It was great! I had a little difficulty tying it, but it was because I had never tied a bow tie with that size bow. With a freestyle or self-tie bow tie, you're letting the world know that you are, indeed, a discerning gentleman; that you don't cut corners and believe that the best things in life are worth the time you invest in doing them. It takes a little practice to master the art of tying a self-tie bow tie. Once you get the knack of it, though, the results are well worth the effort. Use the menus below to browse through everything we offer. 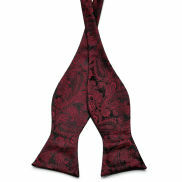 Freestyle bow ties are appealing to the fashion connoisseurs among us, with that air of old-school charm about them. You'd never catch James Bond wearing a clip-on bow tie now, would you? It's certainly easier to tie a regular necktie than a freestyle bow tie. The illustrations here show the 9 steps required to accomplish the feat. After a little practice, you should have no problem tying your own self-tie bow tie. 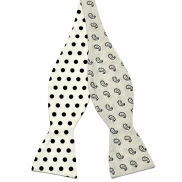 Thanks to their compact size, bow ties can be quite extravagant in solid colors, stripes and polka dot patterns. Bow ties have a very long history. How's that for a conversation starter?